Theatre of War 2: Africa 1943 covers the events of 1943 in Tunisia, North Africa. Recovering from their losses after the crushing defeat and subsequent retreat after the Second Battle of El-Alamein, the German Afrika Korps - reinforced and now supported by the Italian Army - prepare once more to put steel against steel with the Allies. The Axis forces, under the command of the legendary General Erwin Rommel, have an all too brief opportunity to seize victory from the clutches of their earlier failures. Players will lead Rommel’s Afrika Korps in their last full-scale military campaign and command the English and American armies as they try to push the Axis forces out of Africa once and for all. 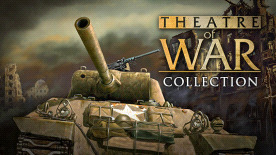 The new expansion pack, Theatre of War 2 – Centauro is dedicated to the 131st Armored Division Centauro and the battles it took part in North Africa starting from December 1942 till mid-May 1943.